For my first post, I wanted to talk about a special bread, something to set the tone for the whole project ahead of me. Looking through recipes, though, I couldn’t make up my mind. A classic, elegant French baguette? A rustic Italian pugliese? My favorite sourdough recipe? Then, I remembered the first bread I ever made. Ripped from the pages of my then-favorite recipe source, Cooking Light, the name alone had enticed me, compelling me to take my first nervous attempt at making Real Bread. Sriracha had recently come into my world via Pho Tau Bay, a Vietnamese restaurant in New Orleans. A cuisine new to me at the time, I became enamored with the huge bowls of brothy wonton soup and the translucent-skinned spring rolls. One strange condiment adorned every table: a bottle of bright red hot sauce with a green top and a rooster logo. Rightly warned about its strength, I learned to use it sparingly, in tiny drops – this was far more intense than the familiar Tabasco! But there was no substitute for the complex layers of flavor behind the heat, and my palate became addicted. I soon bought a bottle from an Asian grocery to use at home on leftovers. So when I saw a bread recipe that called for a full quarter cup of the stuff, I just couldn’t pass it up, even if it meant braving that old culinary boogeyman: yeast. While I was growing up, my mother would turn out countless loaves of tea breads for parties and for gifts. Our freezer usually held at least a dozen loaves: date nut bread, banana bread, and my favorite poppy seed bread. But I don’t recall ever seeing a loaf of Real Bread in our oven: the savory sort of thing seen only in restaurants and bakeries, or sliced in plastic bags, for sandwiches. I had a vague notion that some home cooks could produce such things, but had never attempted such a complicated feat on my own. Wasn’t it very troublesome? Why not just buy it? Yeast was a prime example of a scary and unexplored realm of cooking, best left to the experts. But tempted by visions of a bread redolent with the slow burn of my beloved Sriracha, I decided to have a go. After all, how hard could it really be? I had no idea what I was doing. Not sure what to aim for, and my mother being of little advice on the subject (sorry, Mom), I think I kneaded that first attempt for over twenty minutes (the recipe calls for eight minutes). Dough stuck to my hands and to the counter. I was covered with flour. But I persevered, and several hours later, I had my first loaf of Real Bread. Sliced, it made the best turkey sandwiches. And really, it wasn’t that hard in the end. Maybe there was something to this whole bread making business, after all. Maybe yeast was nothing to be scared of. I filed that recipe away, and recalled it fondly for years. Many hundreds (ok, dozens) of other bread recipes soon cried out to be made; and I, always a sucker for a new recipe, obliged. Recently, one of my friends enlisted me as a tutor. “Teach me how to make bread,” he asked. “Just the most basic kind.” So he came over, and we looked through recipes. Coming across this recipe again, I brushed away nostalgia, read the recipe more closely through the lens of my expertise, and realized that it’s actually a perfect starter recipe. 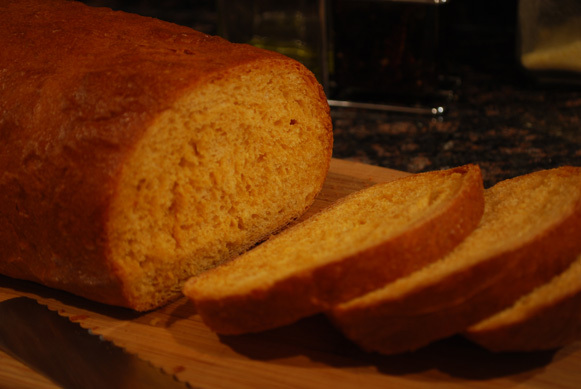 Despite the one unusual ingredient, the recipe is very straightforward, can be done completely by hand, and follows a basic set of bread making steps (which I will delve into more fully at a later date). 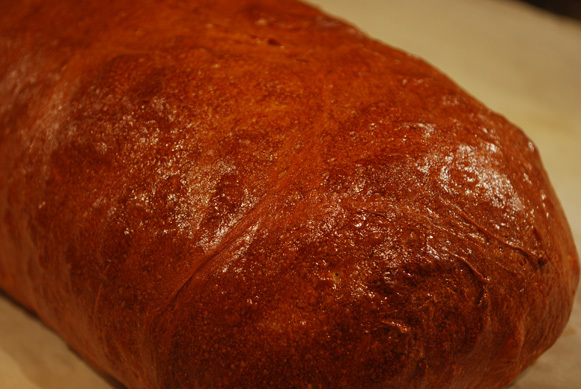 We kneaded and proofed, shaped and baked, and several hours later, had our very own loaf of Spicy Sriracha Bread. Cutting into it, I realized how dense and heavy that first foray had been. This new loaf was light as a feather in comparison, but one bite told me that the memory of perfectly-balanced spiciness had been right on the money. And how much I had learned through the years of all those other breads! I saw that first attempt now for what it was: the result of inexperience, to be sure, but it was the beginning of something much more delicious. It was my very first loaf of Real Bread, making every one that followed it that much better. Every loaf I had made since taught me how to better manipulate the dough, how to tell when enough flour had been added, how to know when it was finished rising. Apropos, then, that I should be showing my friend the same knowledge with the same recipe. And now, I begin my year-long project the same way I began my bread making all those years ago: with Spicy Sriracha Bread. I hope you like it as much as I do. 1. Combine water and Sriracha in a large bowl. Sprinkle yeast over, stir gently, and let stand 5 minutes, or until foamy. (If it isn’t foamy after that amount of time, your yeast is dead. Throw it out and start over.) Add 2 3/4 cups (13 oz) flour, salt, and egg to yeast mixture, stir until a soft dough forms. Turn dough out onto a floured surface. Knead until smooth and elastic (about 8 minutes), adding just enough of remaining flour, 1 tablespoon at a time, to prevent dough from sticking to hands (dough will feel sticky). Form dough into a ball, tucking the sides underneath a little to tighten a skin around the outside of the sphere. 3. Punch dough down (literally, push a fist into the center of the dough; it will deflate), cover and let rest 5 minutes. Turn out onto a lightly-floured surface and press dough into a rectangle (the longer the rectangle, the longer and skinnier your loaf; I like to leave mine a little fatter to make better sandwiches). Roll up the rectangle from the long side, pressing firmly to eliminate air pockets, pinch seam and ends gently to seal. Place roll, seam side down, on a baking sheet lined with parchment paper, or in an 8 1/2 x 4 1/2 inch loaf pan coated lightly with oil. Cover very loosely with plastic wrap and let rise in a warm place 30 minutes or until doubled in size (use the same finger-in-the-side trick to tell when it’s done). 5. Bake for 40 minutes or until lightly browned on bottom and loaf sounds hollow when tapped. Remove from pan, and brush with oil or butter. Cool on a wire rack. 1. Make sure the water is at the right temperature. If it’s too hot, it will kill the yeast. If you don’t have a thermometer, put a drop of the water on the inside of your wrist. If it feels warm, it’s too hot. If it feels the same as your skin, it’s probably just right. 2. Weighing flour is the most accurate way to measure it. It’s certainly not wrong to measure by cups, but for some reason I always measure wrongly that way. Whatever works for you! 3. To speed up rising, microwave a cup of water for about a minute, enough to get it a little steamy. Put your dough, loosely covered (a slightly damp kitchen towel is perfect), in the microwave with the cup of water. It should make rising go much more quickly, even up to half the time. 4. Don’t be afraid to really get your hands in the dough – kneading is what produces gluten, the stuff that gives bread its chewy structure. It’s virtually impossible to overknead by hand, so be fearless! Love the blog – your writting style is very comfortable to read and shows your excitement. Looking forward to future editions. Thanks! Keep checking back; I should have 6 posts every week! I’m enticed! 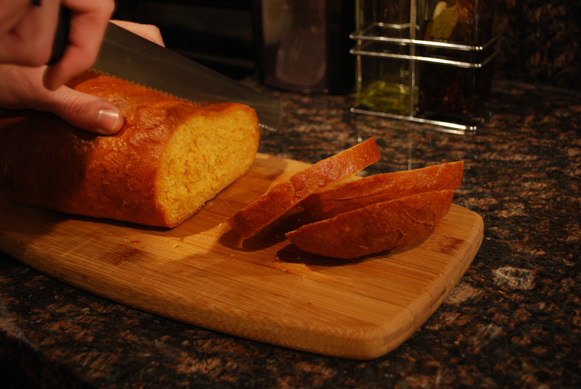 Nothing is better than bread, well maybe except the way you would prepare it. You’ve inspired some baking in my kitchen. Love it, and I’ll be sure to check back!